What are long term Sankalpas and Intentions? How do we create them? It is an intention that you create. It can be a short term intention to guide your yoga practice or it can be a longer term intention to guide your day, week, month, year, or even your life! In 2011, Episode 72 of Namaste Yoga came out and I taught what I thought was the most important class I’ve ever taught. It was an episode dedicated to the concept of sankalpa or intention. In 2012 I created a lecture and accompanying meditations to help members form a meaningful sankalpas to use as guiding philosophies in their lives. 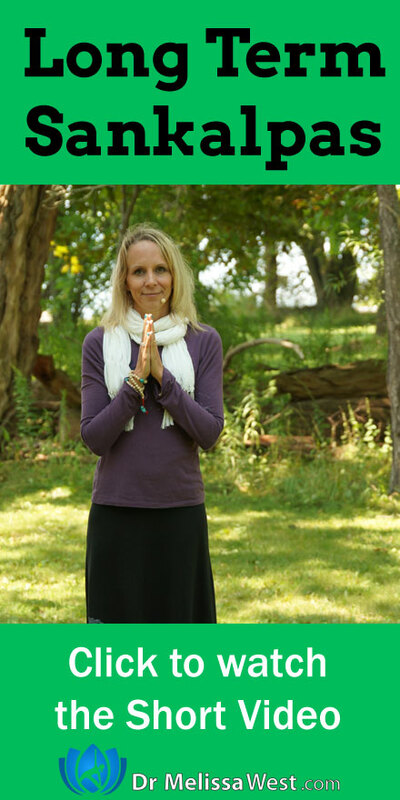 At the beginning of 2013 on the membership site, I created a whole series on Sankalpa with classes to help you set intention for your yoga class, for your day and then longer term intentions. Our teachers spend two weeks studying sankalpa in our continuing education course for teachers. So as you can see, sankalpa and intention creating has been kind of an important guiding principle in my life and in our community. In January of 2013 I created an intention for the year. It was, “With an open heart I receive with joy and gratitude.” This intention was established to create some balance in some perceived imbalance between giving and receiving in my life and a general feeling of exhaustion. It was also brought into being to allow myself to receive your feedback, not just the negative feedback, but also to allow myself to really take in your beautiful positive, heart-centered gratitude. Fast forward 8 months and I have received more love, joy and gratitude than I could ever imagine. I have been gifted beyond what I could ever have dreamed. Our community of Namaste Yoga and the membership community have also greatly benefited from all I have received this year. Our open hearted graduates have taken on leadership roles in our membership site community creating content, Namaste Yoga has been translated into five languages (Spanish, Italian, Finnish, Portuguese, and Russian), I am now being taught Sanskrit, and that is only the tip of the iceberg. What about you? What are your long term sankalpas? What is the longest time you’ve been able to stay with an intention? How do you know when it is time to move on from an intention? Leave your comments below. I look forward to hearing from you about your sankalpas and long term intentions. Next post: Are Inversion Tables good for my neck?